Nilfisk FLOORTEC R 985 turns handling of dust and debris on large indoor floors and outdoor areas into a productive, sustainable and cost-effective process. From start to finish you can solve this task with ease as this ride-on machine is comfortable to drive - with several strong features supporting the user. 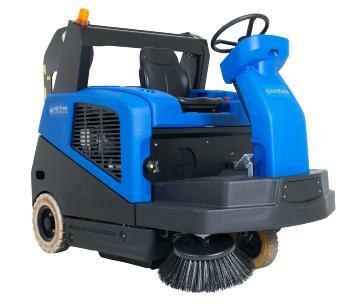 An ideal sweeper for automotive, agriculture, industrial sites and factories, warehouses, distribution centers, multi-stores car parks, etc. Productivity is made higher due to a new innovative system which improves sweeping when the main broom is worn – by increased hopper filling – and by maintaining high efficiency throughout the life of the main broom. Ease-of-use is increased by the new control panel with intuitive icon buttons. Pushing one single button and using the drive pedal is all it takes to activate the sweeping functions of the machine. Simple and comfortable operation!